How do steamy, tropical nights emerge from the Green Acres Theme? 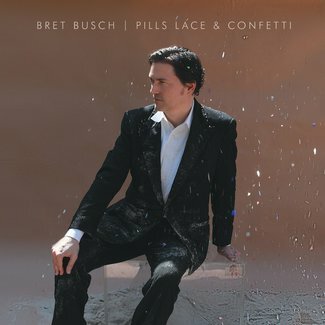 Formerly of the band Pardner, Atlanta music scene veteran Bret Busch is set to launch his new album, Pills Lace & Confetti, on July 14. The album, which has been seeding singles out in the pop music landscape since early-May, promises a mix of humid, island nights and no shortage of knowing nods and asides. Busch has somehow found himself orbiting the world of The New Pornographers. Busch has shared bills previously with Neko Case, and has performed many times alongside Case’s backup singer and frequent collaborator Kelly Hogan (who appeared on a handful of songs on New Pornos album Brill Bruisers). The new record includes contributions from Destroyer’s Joseph Shabason. (FYI: Destroyer is the umbrella title for solo work from Dan Bejar, a previous member of New Pornos.) Janelle Monae percussionist Rafael Pereira contributes as well. The record was produced by Rock*A*Teens bassist Will Joiner. Popdose asked Busch and co-producer Joiner to share with us some of the musical influences that got them to this album. We’re pretty sure you’ll be surprised by what they added to their Spotify playlist.